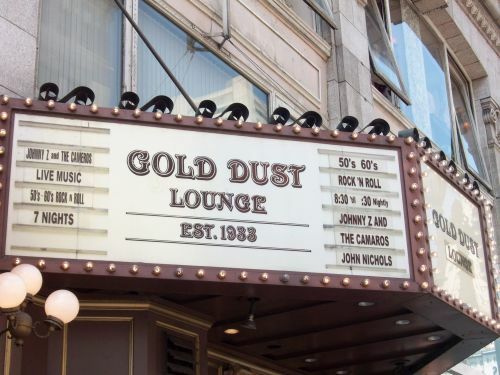 Gold Dust Lounge has been a go to spot in Union Square for as long as I can remember. Their cheap margaritas and Irish Coffees helped ease the pain of dealing with the crowds downtown or helped top off a great night after a show at the Warfield. Although the smell could get a bit dicey (it can be hard to clean up decades of alcohol, juice and probably some things I don’t want to know about out of the carpet), you got used to it by the time you made it halfway through your first drink. The Gold Dust Lounge opened in 1933, but it was run as a bar since 1922 making it the one of the oldest bars in the city. It’s been around longer than the Golden Gate Bridge! Unfortunately, due to issues with the building owner, the received a lease cancellation notice and basically got forced out of their current location. A press conference is scheduled on Wednesday, May 23 at 2:30PM to announce the move to a new location. We will definitely miss the old location, but we wish Jim and Tasios Bovis the best of luck with the move!